• Give woodpeckers, cardinals, pyrrhuloxia and cactus wrens the calories they need by providing suet. 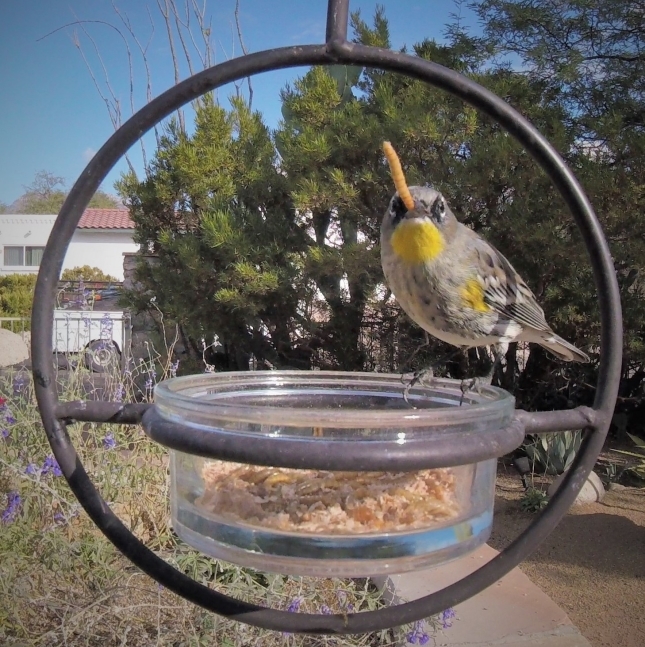 • Look for over-wintering Yellow-rumped Warblers at your water source, suet and mealworm feeders. • Adult Heermann's Gulls leave for Mexico (reverse migration). • Packrats begin their breeding season. • Harris's hawks begin laying eggs..
• Desert succulents are busy soaking up as much moisture from winter rains as their roots and stems can hold. • Flocks of sandhill cranes numbering in the tens of thousands are wintering on the Willcox Playa in southeastern AZ. • First Anna's hummingbirds fledge; keep feeders full and clean. • Curve-billed thrashers and Northern mockingbirds begin singing their territorial songs and nesting late in the month. • Start planning your butterfly and bird gardens this month.